Philadelphia Eagles quarterback Carson Wentz is introduced before a game against the Carolina Panthers. Hue Jackson was fired by the Browns after losing yet another football game. In his time with the Browns, he won three games, and his tenure will be punctuated in the history books by the team passing on the league’s next round of elite quarterbacks, including the Eagles’ Carson Wentz. Now that he’s a free man, he’s got plenty of room to talk about his time in Cleveland, which was tumultuous to say the least. 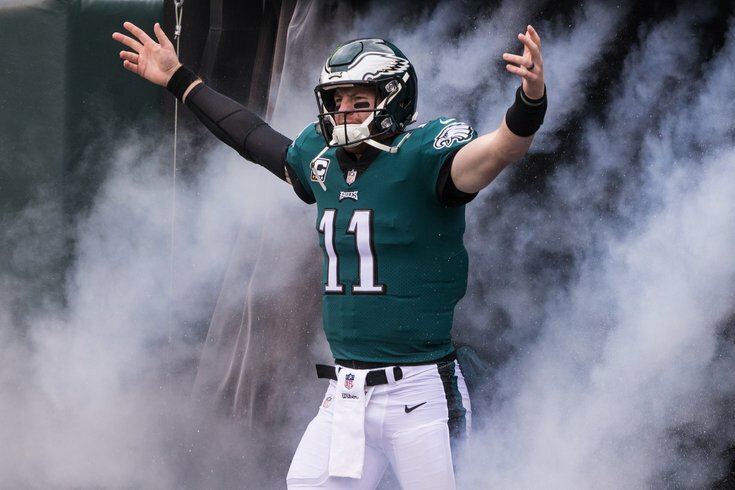 In an interview with Cleveland.com’s Mary Kay Cabot, Jackson offered his takes on plenty, including his team’s decision to trade away the pick that became Wentz. "We passed on three franchise QBs the first two years in Wentz, Watson and Mahomes. We played with a QB room with zero wins in the league. We played with street free agents and practice squad players in WRs. Yet our offense was the same or better than what we were doing this year. There is no way that should happen. "Oh my gosh, yes. Did I like Carson Wentz? Hell yes. He did something that no other quarterback did. I give them three minutes to memorize the book and put on the (white) board. He put it all on the board in two minutes and 48 seconds. I've never had a guy do that ever in my coaching career. Well, that’s about as clear as you can be. Some of this, of course, could be damage control now that he’s looking for another job and wants to be taken seriously by front offices. This information is not new to Cabot’s reporting, though: she reported last December that Jackson had wanted to select Wentz if the Browns kept their pick. In the end, it’s all just gravy after the Browns didn’t consider Wentz a top 20 quarterback in the NFL during the evaluation process. Not only is he a top 20 quarterback, he’s already a Super Bowl champion and he’ll likely be a top 5 quarterback in the league for the next decade. And apparently, when the Browns passed on him, they ignored their head coach's preferences.